About 680 million chickens are raised for meat and eggs in Canada each year. Produced in factories like mere things, they live short, nightmarish lives. Do you know where your food comes from? 650,000,000 chickens in Canada are raised for meat each year a.k.a. "broiler chickens". Raised in crowded, dark barns, meat chickens first see sunlight on the way to slaughter. Many die en route. Birds used for breeding live for about 1 year and endure stress, confinement, and deprivation. Their offspring is killed for meat at just over 1 month of age. 26,000,000 chickens in Canada lay eggs for human consumption. 90% of egg laying hens in Canada live packed into rows of filthy "battery" cages. Forced to lay 20 times more eggs than their wild relatives, hens suffer severe injuries. After just 1 year of laying eggs, when aggressive egg production declines, the "spent" hens are killed. See why birds may freeze during transport or get their wings broken during loading. See an example of an enriched environment that lets chickens engage in natural behaviors. See stages of the slaughter process and learn how many chickens are killed each minute. 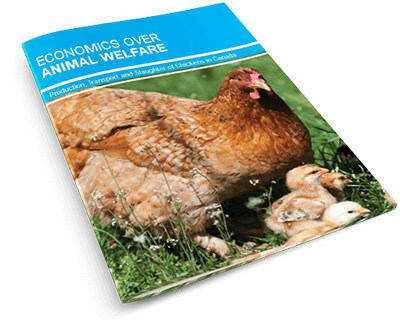 Download a printable PDF brochure about meat and laying chickens. Or send us an email to receive free print copies. In both magnitude and severity, [chicken production is] the single most severe example of man’s inhumanity to another sentient animal. See our overview of the Maple Lodge Farms trial, plus a full report about the current state of chicken welfare in Canada.